What Fish Species Are Coldwater? The most common coldwater fish is the goldfish, followed closely by its larger counterpart, the koi. However, there are many other interesting fish that do not require a heated tank. Many coldwater fish are so large that they are only suitable for ponds. Because you are planning to set up an aquarium, here's a list of fish that are small to medium in size. Barbs - Several readily available species of barbs are tolerant of temperatures into the mid-60s, or even lower. All are easy to care for and are suitable for a community aquarium. They include the gold barb (Barbus schuberti), the green barb (Barbus schuberti), the rosy barb (Barbus conchonius), and the two spot barb (Barbus ticto). Bloodfin Tetra - Both the standard bloodfin (Aphyocharax anisitsi), and the false bloodfin (Aphyocharax dentatus) tolerate temperatures as low as the mid-60s. Bloodfins are offered in many pet shops, they're easy to care for and are quite hardy. They are active top dwellers and are best kept in schools. Buenos Aires Tetra (Hemigrammus caudovittatus) - Easily found for sale, they will tolerate temperatures into the mid-60s. Choose between standard varieties and albino variants. Like bloodfins, they are undemanding and easy to care for. They are suitable for a community tank but will voraciously eat live plants. Croaking Tetra (Coelurichthys microlepis) - Not often found for sale, they are an attractive fish that is worth shopping around for. Like other coldwater tetras, they are easy to care for and are suitable for community tanks. 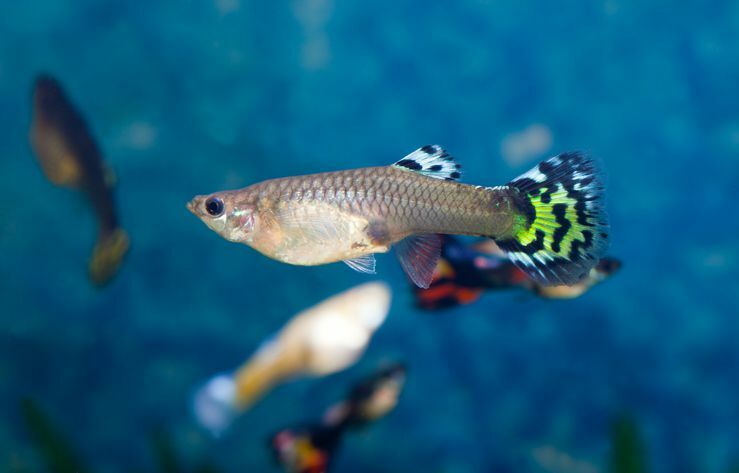 Guppy (Poecilia reticulata) - As readily available as any fish, there are many attractive variations of this popular fish. Hillstream Loaches - Although they are not often seen in pet shops, some species can be found for sale from time to time. Not all of them prefer cool temperatures, but most will tolerate temps that fall into the mid-to-upper-60s. Native Fish - A variety of North American native fish are now being sold in the aquarium trade. Virtually all of them tolerate cool water. Availability varies from state to state, as do laws regarding which species may be legally kept in home aquariums. Keep in mind that some will become too large to keep in a standard aquarium. Pearl Danio (Danio albolineatus) - Like the zebra danio, this fish is very hardy and easy to care for. It will tolerate temperatures into the mid-60's without difficulty and is easy to find. They are larger than zebras, but need not be kept in schools. Weather Loach (Misgurnus angullicaudatus) - Readily available, this loach is one of the easiest to care for. Couple that with the fact that they will tolerate temperatures in the fifties, they're excellent candidates for a coldwater tank. Wimple (Myxocyprinus asiaticus) - Also known as the freshwater batfish. Not commonly found, it is an unusual fish that is worth tracking down if you like to have something unique. It will tolerate temps into the mid-60s. Zebra Danio (Brachydanio rerio) - Outside of goldfish and the guppy, the zebra is the most readily available of all coldwater fish. They tolerate temps that fall into the mid-60s and are very easy to care for. Long-finned species are available, as well as a popular leopard spotted variety. There are many other coldwater species, but the above list should give you enough options to get started. Good luck with your coldwater aquarium!